From November 8th-10th developers, designers and others from the Grand Rapids area joined together to help local non-profits with their websites in an event called GiveCamp Grand Rapids. Over the long weekend, OST App Dev team members Brian Scaturro, Brandon Meyer, Garret Hoofman, Kirk Roerig, Jason Sich, Jeff Timreck and Tom Fish helped four local non-profits develop four new websites to help with their needs. This all began a few months ago when the possibility of putting together an OST team for GiveCamp was brought up at one of monthly App Dev meetings. It didn’t take long for some of our developers to volunteer and form a team. We were tasked with a specific job this year – could we create a single donor database that would fit the needs of Hand2Hand, Grandville Avenue Arts & Humanities and Red Project GR? Part of being a good consultant is finding the best solution that fits your customer. While researching donor databases our team found a mature & maintained open source project called CiviCRM that did everything that the non-profits wanted, plus a little more. We came to realize that CiviCRM would be a better solution than what we could build from scratch, so that’s what we went with. We still got to use some of the new tools that we were looking at using. Brian Scaturro created a solution that could automatically provision a new virtual machine fully configured with CiviCRM within minutes. That was amazing but it also meant that we wouldn’t need the whole team to work on these projects. So a few days before the event was scheduled to begin we asked if there were any more projects that we could work on. Since it was so late in the game we weren’t sure there would be any other development projects left but we lucked out. MomsBloom is an organization that matches new mothers with volunteers for help and support. The information that they gathered about the mothers and volunteers was placed in an Excel sheet and notebook. They were looking for a new app to help them keep track of this information. Friday night we started work. The CiviCRM installations for the other three projects went quickly. Jeff Timreck and Tom Fish (data guru) teamed up and were able to launch, configure and import existing data into the CiviCRM install in no time. It was only on the Friday morning that we were able to gather the requirements for the MomsBloom project, so we had a long way to go to finish it. Over the weekend, we stayed up late each night and came in early every morning. It was constant work for our team members and we faced a few challenges by using a new tech stack. To help break things up a bit, some of the more athletic members of our team ran a .1k at noon on Saturday! Overall, GiveCamp went really well. We were able to help out four local non-profits instead of just the one we had originally expected. And top of that, we had the opportunity to bond as App Dev team members. It’s great to know that each of the projects we worked on will help a non-profit do more good for the local community. The total contributions that GiveCamp provided for the community ended up being estimated at $250,000 worth of services to 17 non-profits. I’d like to thank the participating App Dev team members for the time & talents that they donated. I’d also like to thank fellow OST’s Tamara Iakiri, Beth Van Slyke, and Lizzie Williams for their help in organizing this year’s GiveCamp. Click here to see more photo’s from the GiveCamp Grand Rapids. 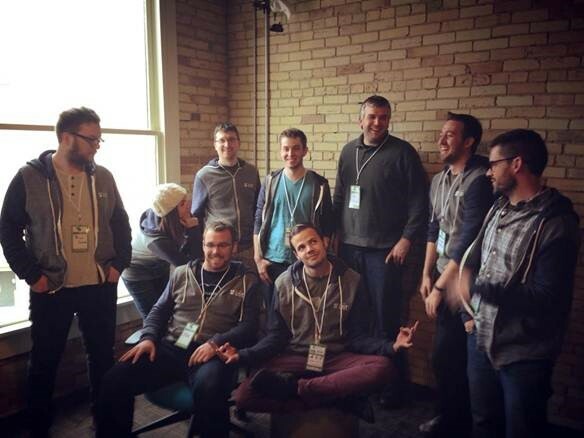 Photo of Brian Scaturro, Lizzie Williams, Brandon Meyer, Joe Rivard, Garret Hoofman, Kirk Roerig, Jason Sich, Jeff Timreck and Tom Fish at GR GiveCamp. Jason Sich is an Application Developer at Open Systems Technologies. Jason is the writer of the blog post and was a volunteer at GiveCamp Grand Rapids 2013.